The green body with the chrome firewall looks really food with the green accents on the valve covers and the rest of the engine! Even if you’re not into Fords, you can recognize the iconic nature of a Ford roadster hot rod. The original hot rod builds of the early ‘50s were based on the Ford bodies with V8 engines, and this build is a custom, more modern version of that same build style that we’ve known and loved for decades. This is one cool roadster! We love the look of this build, but the color is really what drew us in. The green is deep and metallic and you can't really appreciate it without seeing it in person. The pictures just don't do it justice! Owned and built by Jerry Schumacher of Bonney Lake, Washington, Jerry has owned this car for nearly 3-decades. “I’ve had the car for 27-years,” Jerry said. “I built it when I was 21 years old.” It’s been painted many different colors over the years, starting with flat black all around, then later getting some flames. It was also solver with flames after that before being painted green like this, and this is how it’s been for the last 3-years. The big-block Chevy was definitely a good choice for this build. While some purists may not like it, there is no denying that a big-block Chevy is a great way to get loads of power and almost always is the best bang-for-your-buck value, or in this case the best horsepower-to-dollar ratio. 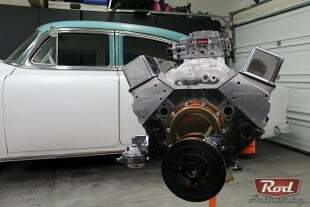 The transmission is a turbo-350 automatic and the rearend is a narrowed Mopar housing with 3.73:1 positraction gearing. Fuel is provided by way of a Holley 650cfm carburetor and spark comes from the performance HEI ignition. The mileage on the speedometer is accurate to what Jerry has driven it since he finished the car: 13,812 miles. Over the course of nearly 30-years that’s not a lot per year, but when you’re the owner of a hotrod shop, JS Custom out of Bonney Lake, Washington, you’ve got plenty of other cars and projects to keep you busy, so with all those different cars to choose from over the years, 13,812 doesn’t seem so small anymore. After all, this is a car that he’s kept through the decades and he wants to keep it nice. The simple black interior has kept well over the years and has gone with all the different iterations of the colors on this car. We also love the custom touches like the skull on the shift knob, the pinstriping, and the metallic flaked steering wheel. This is a real twist on the classic hotrod look, but it definitely draws a lot of style and inspiration on the history that it was built on. All-in-all, this is definitely one of our favorite Ford roadster builds. There’s something about the way the stance works with the aesthetic of the color and the big-block Chevy that makes it an alluring car. The look of the car draws you in and it’s a clear attention grabber at any show that it attends. There’s no doubt that this is a cool car, and the fact that Jerry has built, rebuilt, driven, and cared for this car for nearly 30-years makes it even cooler.